On behalf of Unite the union, Survation interviewed 1016 residents of Prime Minister David Cameron’s constituency of Witney and 1062 residents of Secretary of State for Health Jeremy Hunt’s constituency of South West Surrey by telephone. Fieldwork was conducted between 2-5 December. What Is The Most Important Local Issue In The Prime Minister’s Constituency? Local NHS and GP services are by far the most important local issue in Witney – almost three times as important as immigration. 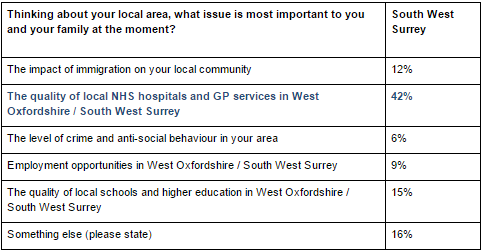 Local NHS and GP services are by far the most important issue in South West Surrey – as important a local issue as crime, immigration, employment and education put together. We also asked Mr Cameron and Mr Hunt’s constituents about the Transatlantic Trade and Investment Partnership. The deal, dubbed TTIP, is currently being negotiated between the EU and the USA. A majority of constituents in both constituencies told Survation they oppose the inclusion of the NHS in the agreement. The majority of both Mr Cameron and Mr Hunt’s constituents think the Prime Minister should seek to exclude the NHS from the agreement. If Mr Cameron were unable to achieve a guaranteed opt-out for the NHS, residents of Witney and South West Surrey that had a view told Survation he should veto the agreement. Unsurprisingly in these rural safe Conservative seats, headline results suggest that both Mr Cameron and Mr Hunt will safely keep their seats next May – Mr Cameron leads UKIP – his closest challenger by 34 points and Mr Hunt ahead of UKIP by 42 points in our snapshots. Comparing the results of these polls to the 2010 general election, in both seats UKIP have since overtaken the Liberal Democrats to claim second place. UKIP are now polling on 19% in Mr Cameron’s Witney seat, up 16 points from their 2010 result in the seat. Similarly, UKIP are polling on 15% in South West Surrey, up from 2% in 2010. Our polls also suggest both the Greens and Labour are doing better in these South East seats than in 2010. Full tables for the poll in Witney including the full questions put are available here. Tables for the polling in South West Surrey are available here. Survation is a member of the British Polling Council and abides by its rules.